5W in 125 out .... 15 in over 300 watts out! 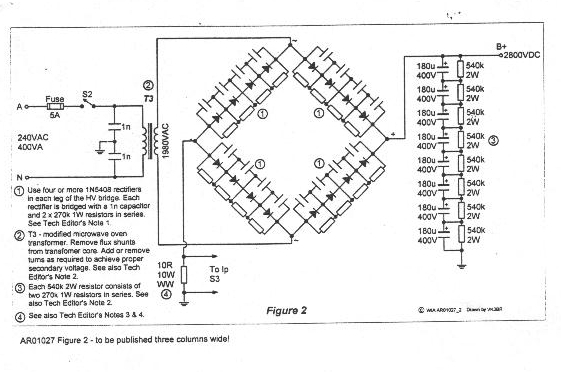 Note: 1) It has come to my attention that there is an error in the RF schematic. The capacitor going to the screen diode stack should be a 47nf (.047 uf) capacitor, not a 470nf (.470uf). 2) It appears he 1N4007 rectifier across the coil of "K1" is shown in the wrong direction. After successfully converting the Twin Crystal Filter 40 meter QRP transceiver, designed by Drew Diamond, VK3XU, onto the 20 meter band I decided to build a single band amplifier comparable to the 100 watt output of the modern transceiver. Compact and with low drive requirements for the QRP rig for those evenings when the band was not favorable for just 4-5 watts and a dipole at 30 feet. After much thought the decision was made to use a single 813 Beam Power Tube wired in the not so famous G2DAF configuration. 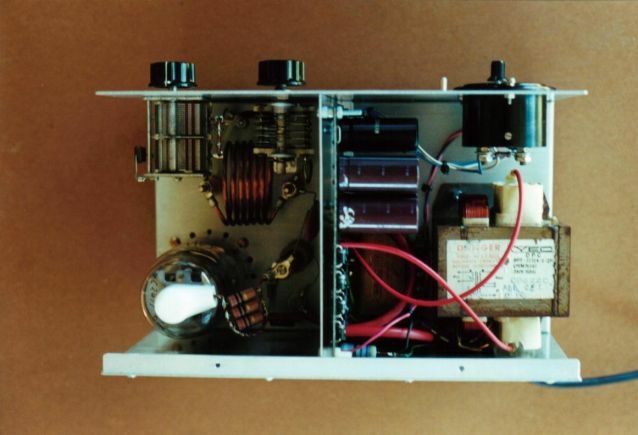 There has been many 813 amplifier articles written over the years in a half a dozen radio magazines and this one is not much different except for some outback engineering and humor in building it. Recently there was a very nice article written by C. J. Bourke, VK3YE featured in AR not so long ago. It featured 2) 813’s in the G2DAF configuration with Part #1 in April 1999 and Part #2 in March 1999. I highly recommend you read this fine article. I have decided not to include the theory and concentrate on what someone is up against when trying to build a linear amplifier when living in outback Australia. You can only pester your mates for so long before they get annoyed at all the requests to source parts and post them to remote locations. It turns out that the local rubbish tip can be an excellent choice for parts if you have access to it and you don’t mind being seen there. The usual warning applies here. This project uses high voltages and high voltage can and could kill you. 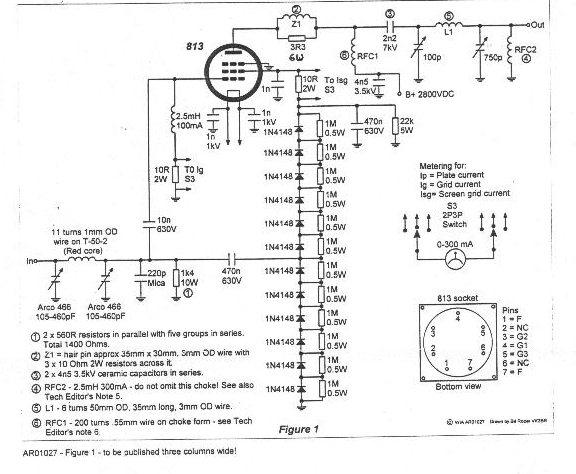 If you don’t feel that you’re competent with this, possibly you should pass on this project or look into building a solid state amplifier which uses 12 or 24 Volts DC. The HV transformer is from a microwave oven found at the tip. It is about 400 VA in size according to it’s core cross sectional area and a few mods must be done to it before it can be used. Firstly, the flux shunts must be removed. These are the 2 small stacks of steel laminations between the primary and secondary windings. A small length of 6.5mm square key steel and a hammer where used to do this. This leaves plenty of room to wind the extra turns on the primary as described later. Secondly, one side of the HV secondary is tied to the actual steel laminations of the transformer. This must be removed so that no windings on the hv secondary are touching the core laminations! Not having any sort of hv probe to test the transformer and for safety reasons, I decided to apply an accurately known low AC voltage of 6.30 VAC onto the primary and accurately read the results on the secondary. After this was completed it was found that the transformer had a turns ratio of 1 to 9.72, or for every volt applied to the primary there would be 9.72 times the primary volt on the secondary. Being 240 volts on the primary, there would be 2333 volts on the secondary. After rectifying and filtering this would raise to about 3300 VDC. Just a bit to high for the 813. Looking at the secondary, which was totally encapsulated in varnish, it was decided to add turns to the primary to try to reduce the turns ratio, hence, reduce the secondary high voltage. Enough turns were added to the primary to bring the secondary voltage down to about 1980 volts AC. Now after rectifying and filtering the voltage is a respectable 2800 VDC. The filament transformer is of the 50 VA vintage, again found at the local tip. It had a 240 volt primary but the secondary needed to be rewired to accommodate the 10vac, 5 amps and center tapped requirements for the filament of the 813. 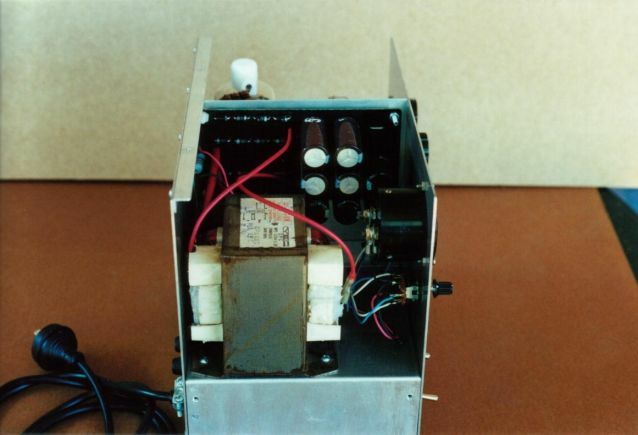 The control voltage transformer was removed from a discarded portable stereo at the tip. It had secondary AC voltages of 9 and 18. When rectified and filtered they produced 12.75 VDC and 25.50 VDC. Almost exactly what was needed! While at the local tip one afternoon when dropping off grass clippings and tree limbs I spotted 4 abandoned computers and monitors that were heavily bombarded by bricks and large stones. In the back of each of these monitors were 2) 180uf, 400vdc electrolytic capacitors. This was a real money saver. I believe they would have been at least 10 dollars each if I needed to buy them new. Just as a side note, I have yet to find a computer monitor or TV set at the local tip with out some sort of brick, stone or metal object protruding out the front of the picture tube! What a shame! Having used the only plate choke I had in a previous amplifier project it was decided to cut about 150mm off of the end of a standard 22mm OD. wooden garden rake handle. This was put into the chuck on the drill press and turned down. Crudely made lathe tools which I will not discuss were used to turn the first 75mm +/- down to about 13 mm in diameter. The next 8mm was left at 22mm OD. The next 8mm turned down to 17mm OD. The next 8mm was left at 22mm OD. The next 8 mm turned down to 17mm OD. Then the last 10mm was left at 22mm OD. The remaining length of the handle was cut off and discarded. Over all length is about 120mm. A 3mm hole was drilled on center in each end of the plate choke form to accommodate a sheet metal screw. One screw used on the bottom for attaching the form to the chassis and one to attach the lugs from the plate blocking capacitor and parasitic suppressor to the top of the choke form. Enamel covered wire from a motor starter contactor coil was used to wind the choke. I’m not sure exactly how many turns are on it because I can’t see that good but I think it’s just about 200. A few coats of varnish were brushed onto the windings. Beware no to over do it like I did. I later tried to remove a few turns from the top of the choke but found it difficult now that the varnish brushed on was so thick that it had encapsulated the fine wire. Looking in the junk box during the construction of this amp I could only find one capacitor with a value of about 100pf but the plate spacing was definitely to close. The capacitor was actually installed in the completed amp but as foreseen, it arced over between the plates. To fix this problem all the stationary stator and movable rotor capacitor plates were removed, except one stationary plate on the end. A small piece of circuit board material was used as a spacer and placed on top of this last stationary plate. Now one of the movable rotor plates earlier removed was placed on top of the circuit board material and re-soldered back onto the rotor. The circuit board material was now removed from between these two plates and placed on top of the newly soldered in movable rotor plate. A stationary stator plate was now placed on the circuit board material and re-soldered in place. This continued until as many plates could be soldered back on to the capacitor stator and rotor. Now that the newly modified capacitor is complete, a new problem has now arisen. The capacitor seems to have lost a lot of it’s capacitance now that the plate spacing was almost tripled! So to cure this problem a small 30pf doorknob capacitor was placed in parallel with the newly modified tuning capacitor. This doorknob is not shown in the photographs. The plate coil was made from 3mm OD. wire that was removed from a transformer used in a earlier project. The wire was straightened by putting one end of the wire in the vice and holding onto the other end with pliers and pulling the wire tight. This wire was then wrapped around a Aerogard (tm) can as a temporary form. The wire was then removed, excess turns were then cut so 6 remained. Tension was then put onto the coil ends so the turns were permanently spaced by the thickness of the wire. The coil is now, 6 turns, 50mm ID. and 35mm long. Appropriate lugs were soldered onto the wire to fit the threads on the insulated stand offs. The 0-200 mA. meter was the only meter available from the junk box. I highly recommend a 0-300 mA. meter be used if possible as the plate current will peg the needle point to the far right when the amplifier is driven with about 10 watts or more. The heart of the chassis is the 3in. x 7in. x 12in. aluminum rectangle box. The front, back, bottom and internal chassis partitions were all made from wrecked aluminum signs recovered from the tip after the clean up from Cyclone “John” which crossed the N.W. coast in Dec. of 1999. The top was the last part of the chassis to be made. It was cut from existing 1mm thick aluminum sheeting that was on hand and bent with a home made sheet metal brake. It was decided to recess the 813 socket by the length of the metal base of the tube to reduce the height of the chassis and give the amplifier a lower profile look. More along the lines of a lower and wider chassis rather than a taller and narrower look. Recessing the tube dropped the height by the thickness of the metal base of the 813 and the ceramic socket. The majority of the chassis parts were “finished” by sanding them with water and 120 grit wet and dry sand paper. Sanding should be done all in one direction and done long enough to remove any pencil, pen or scratches in the aluminum. After sanding a light coat of cheap clear lacquer was sprayed on them. The longer you sand them the better they will look, so beware you might get soar fingers! The Passive grid was originally 50 ohms, 5) 10 ohm 2 watt resistors in series which were salvaged from an old commercial A.V.R. (automatic voltage regulator). It was found during tune up and testing that the small QRP rig just didn’t have the drive with 4-5 watts to develop enough screen voltage to properly drive the amplifier to full output. 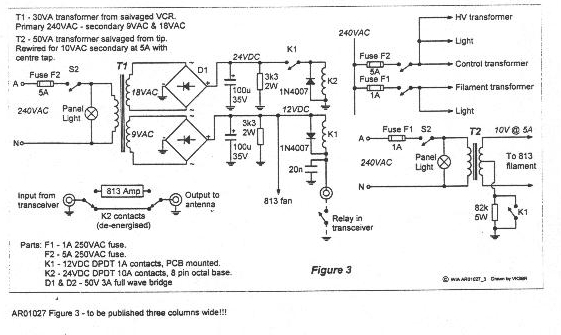 As a suggestion by Doug VK6ER, the passive grid resistance should be increased into the hundreds or even thousands of ohms and a tuned circuit placed on the input of the amplifier. From the junk box a new passive resistance was now set at 1400 ohms. 2) 560 ohm 1 watt resistors in parallel, with 5 of these groups in series. Don’t leave out the tuned circuit. If you try to drive the 1400 ohm passive grid from a 50 ohm 4-5 watt QRP rig you’ll really qualify for QRP. Probably in the micro watts! Before getting too anxious to fire up your new outback 813 amplifier, check all your wiring and connections. Then check them again, and then check them again. Your bound to make at least one mistake. I actually made three. Two were spotted in the under chassis before power was applied and the third was later found in the RF deck and was a connection I had forgotten to solder. Believe me, you’ll see sparks and a bit of smoke from an amplifier trying to pass 300 watts on a connection that has not been soldered! Something a bit similar to a small little Tesla Coil! Tune up was a cinch! A small amount of drive [single tone] of a few watts on 14.175mhz. was applied to the input of the amplifier with the SWR/Watt meter inserted in between. The two Arco mica trimmers on the input were adjusted until the SWR reading was flat. SWR at the band edges only slightly raised when driving it at the top and bottom of the 20 meter band. Now the SWR/Watt meter was inserted in between the amplifier and a 50 ohm high power homebrew dummy load. 5 watts was applied to the amplifier. The screen voltage increased rapidly to about 95vdc. Output on the watt meter indicated 135 watts. 10 watts was applied, screen voltage increased to 150vdc and output on the wattmeter indicated 225 watts. 15 watts was applied, screen voltage increased to 175vdc and output on the wattmeter now indicated 300 watts! Beware, with a high value of passive resistance it can be lightly driven and the 813 bottle will take off like a rocket! for one very brief 50+ watt key up and shorted out one half of the diode stack. This plagued me for a few (hours) until I noticed low screen voltage being developed and finally traced the fault back to the diodes. I realize that true QRP operators are probably shaking in their boots at the thought of connecting an amplifier to the QRP rig but I consider myself an “all rounder” who dabbles in many aspects of the hobby such as SSTV, QRP, Satellites, Packet and sometimes a plain ol’ QSO on 20 meters. All in all I feel this project has been a success. It has met all my initial requirements before construction such as low drive, compact amplifier design to fit nicely on the desktop and exceeded my expectations with more then 100 watts output with just 5 watts drive. During the construction of this project the only test equipment available was a digital multi meter. All other equipment either didn’t work properly or was unavailable. So only on air QSO’s to other station was the only post construction testing available. Total cost of the amplifier was around 25 dollars. Of course that’s not including my time.